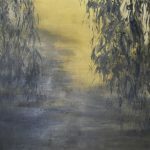 Artspace Loughborough has a new exhibition from 21st July at Leicester’s Curve theatre. 14 members of the group have produced paintings, drawings, mixed media and digital work on the theme ‘Looking Back’. Artspace Loughborough exists to promote and exhibit contemporary art and to provide a support network for trained artists. It currently has 21 members – painters, sculptors, printmakers, mixed media artists – who live or work in the Charnwood area. They have received many awards. In 2005, they exhibited in Venice alongside the prestigious Biennale as part of a cultural exchange. Several artists have used the theme to explore their response to past man-made monuments or materials ranging from Stonehenge to nineteenth-century New Zealand wallpaper. Some of the artists have considered the relationship between buildings and nature over time. Others have used past literature as inspiration ranging from The Secret Garden to Dylan Thomas. 5 artists have based their work on personal memories: a father’s story of his return from war, childhood spent in a boarding school, and responses to nature in solitude. Click here to see the online version where most of the art work is for sale.